Images from migraine surgery suggest that my headaches were caused by compressed nerves in my neck. Migraine surgery is a surgical approach to treating chronic headaches. The procedure involves releasing compressed nerves in the back of the neck, eyes and temples that are causing a patient's headaches. It is also referred to as migraine release or migraine nerve decompression surgery. The philosophical underpinning of this procedure is the peripheral nerve theory of headaches, which states that migraines can be caused by compression to peripheral nerves in the head and neck rather than a chemical imbalance in the brain. Where to find a migraine surgeon? Roughly 250 physicians worldwide are trained migraine surgeons. This is a tiny number, considering that there are 35 million migraineurs in the United States alone. And migraine surgeons are either all or mostly plastic surgeons, not neurosurgeons. Plastic surgeon Dr. Bahman Guyuron discovered migraine surgery accidentally after his forehead lift patients began reporting a cessation of their headaches (during the forehead lift, he had release compressed nerves). Dr. Ziv Peled, an amazing and brilliant doctor, was my migraine surgeon. With my migraine surgeon Dr. Ziv Peled at my first post-op, just 4 days after life-changing surgery. Location of my headache pain: My headaches emanated out of a small area in the back of my neck that was a common area of compression for the greater and lesser occipital nerves, two of the main migraine peripheral nerve culprits. History of injury to headache location: In 2011 I had suffered an injury to the back of my neck throwing a football. That injury resulted in a month long headache that almost caused me to miss a semester of college. This made it more likely that I was dealing with some kind of scar tissue or other nerve damage to my occipital nerves. Other treatments failed: Before discovering migraine surgery, I had tried everything under the sun to treat my headaches. Yet the migraines became worse. This suggested some kind of underlying structural, not chemical, cause of my headaches. One caveat to this is that triptans can be effective at aborting peripheral nerve headaches, as is the case for me. Peripheral nerve blocks worked: During a severe migraine episode, Dr. Ziv Peled injected various nerves in my neck, eyes and temples with a novocaine-like numbing medicine. As he injected each nerve, taking it offline, my headache pain gradually reduced to a 0/10. Since taking the nerves offline eliminated my pain, this meant that the headache pain was coming from these nerves. This diagnostic is the smoking gun that proved that my headaches really were caused by peripheral nerves throughout my head and neck. Were my headaches caused by compressed nerves in my neck? The following photos from my migraine surgery with Dr. Ziv Peled suggest they were. 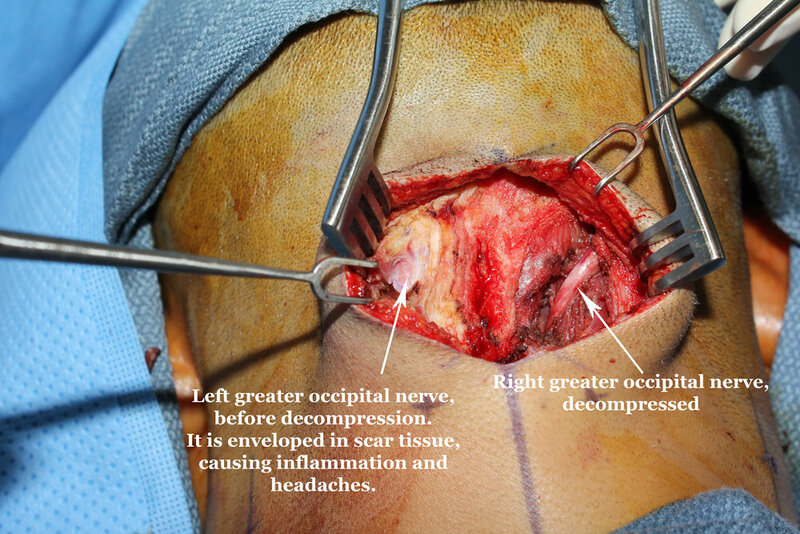 Images 1, 2 and 3: Severe Compression of my Greater Occipital Nerves. In IMAGE 1 on the right you see my right greater occipital nerve already decompressed by Dr. Peled. The nerve looks like a wide egg noodle, and it is surrounded by tissue that has been charred black by Dr. Peled's tissue burning tool which he used to free the nerve from tissue that was compressing it. On the left is my compressed left greater occipital nerve, before Dr. Peled released it. Actually, you cannot even identify the nerve because it is so buried in white scar tissue that looks like steak fat. This is what my right greater occipital nerve looked like before decompression too. My greater occipital nerves were constantly irritated and inflamed by this white scar tissue. My headaches were symptoms of this compression. The following 2 photos show my left greater occipital nerve after decompression by Dr. Peled. Finally the nerve looks like a wide egg noodle, as it should. In this image you can see 3 branches of my right lesser occipital nerve. The nerve branches look like the roots of a small plant. The image reveals that my lesser occipital nerves have a genetic abnormality that resulted in constant nerve compression. Normally, the lesser occipital nerves have one branch and run beneath the sternocleidomastoid muscle. This image shows that my right lesser occipital nerve has 3 branches, and two of which ran above the sternocleidomastoid muscle, between the muscle and the skin. Dr. Peled said that even more remarkably, my left lesser occipital nerve had 4 branches instead of 3. As a result, every time I engaged my sternocleidomastoid muscles (basically every time I moved my neck) these nerves were pinched between the muscle and the skin. The outcome was constant inflammation of the lesser occipital nerves, and resulting chronic headaches. Neuroplasty - Free-up the nerve from surrounding tissue, blood vessels, etc. that may be compressing it. Neuroplasty preserves the nerve. 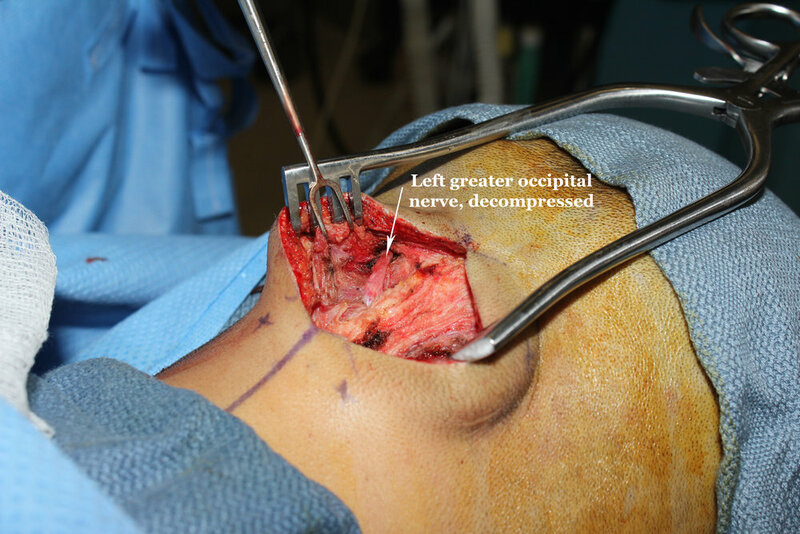 Neurectomy - Surgical removal of the compressed nerve. The nerve is cut upstream of its first point of compression, and the live end of the nerve is buried in muscle. This occurs when the nerve is damaged beyond repair. Permanent numbness to the innervated area results. Dr. Peled performed neuroplasty on my greater occipital nerves (as shown in the photos above), and performed neurectomy on my lesser and third occipital nerves. The third occipital nerve (not shown in any photos above) is a small nerve located lower on the neck than the greater occipital nerve that innervates a small area at the base of the neck. My lessers and thirds could not be salvaged. I don't miss them. The images leave no doubt that my greater and lesser nerves were compressed. But did decompressing them cure my headaches? Yes. In the two months since surgery, I have had almost zero headache symptoms in my neck. This is miraculous, because before surgery I was having headache pain every other day, with an average of one extreme 10/10 pain episode with vomiting per week. I continue to have mild headache symptoms in my eyes and temples and am considering a follow up migraine release surgery on those areas as well to be cured of all headache symptoms once and for all. In this post I have established that prior to migraine surgery, I had accumulated severe nerve compression in my neck, and that this compression was the direct trigger of my migraine headaches. An inquiring mind might now reasonably ask: well what caused this nerve compression in the first place? I believe that a lifetime of poor neck posture is responsible for the nerve damage seen in the above photos. But we won't stop there. Because upon closer investigation we find that poor neck posture is itself just a symptom of the true root cause of my chronic headaches: abnormal facial growth.